Sometimes fate can play some cruel tricks. Dan Jetter, of Aurora ColoRODo, went with a friend to look at a ’55 Cadillac convertible. While the friend was negotiating the price, Dan snooped around, found a sad old ’54 Cadillac two door hardtop hiding behind the barn. The car had been an “ad car” for local businesses to advertise on the sides for many years in a Southern ColoRODo town. The town owned the Caddy and kept it parked at the airport for local pilots to use, but Dan wasn’t looking to purchase a car, even though it had an interesting history. In the meantime, said friend declined the ‘55 as “too expensive to rebuild” and asked if there were any other Caddy’s for sale. He had the ’54 for sale and it does run. The owner retrieved a gallon of gas and a battery, set the can on the fender, ran a hose to the carb and hooked up the battery. The car fired up after three turns even tho it had been sitting for four years. Dan’s friend wasn’t interested so Dan asked the price and a deal was struck – Dan trailered the car home on the trailer his friend had brought along for the ’55 convertible. The first thing was to remove all the hand-painted advertising from the sides of the car and put the car in gray primer. Dan wanted a ‘rat rod type” car – no shiny paint, no rechromed bumpers, no new interior, but as the days/weeks went by, his brother Roger changed his mind. Not one to leave anything stock, Roger suggested doing some mods – the grille was the first to change – several ’58 Buicks gave up their grilles- a framework was built to hold each section of four chromed “blocks” and a ‘57 Chevy truck gave up its park lights. The hood and deck were peaked with 3/16” round rod after removing all the emblems/door handles and Lake Pipes shrouds were added. The skirts were sectioned and a 3” piece was added to lower them. The stock side scoop chrome trim was removed and the scoop opened and a smaller scoop added above it to mimic the front fender body line. 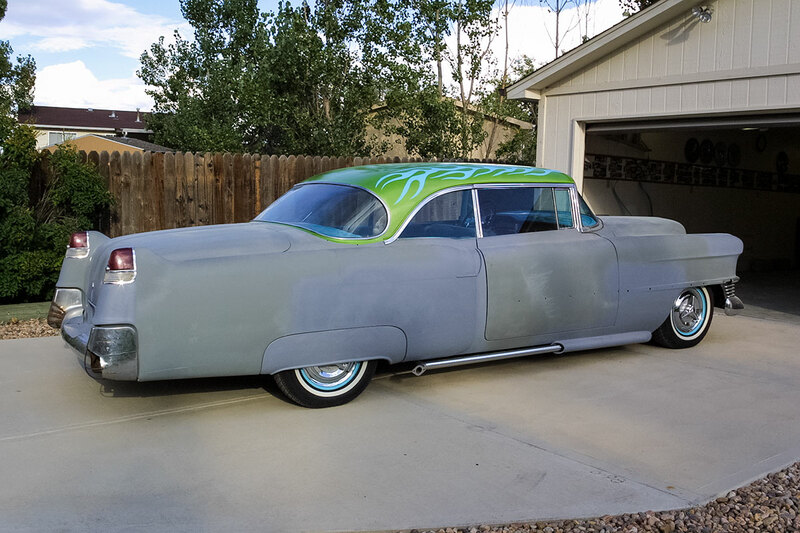 A ’52 Cadillac gave up some of its side trim and it was placed on the rear quarter. 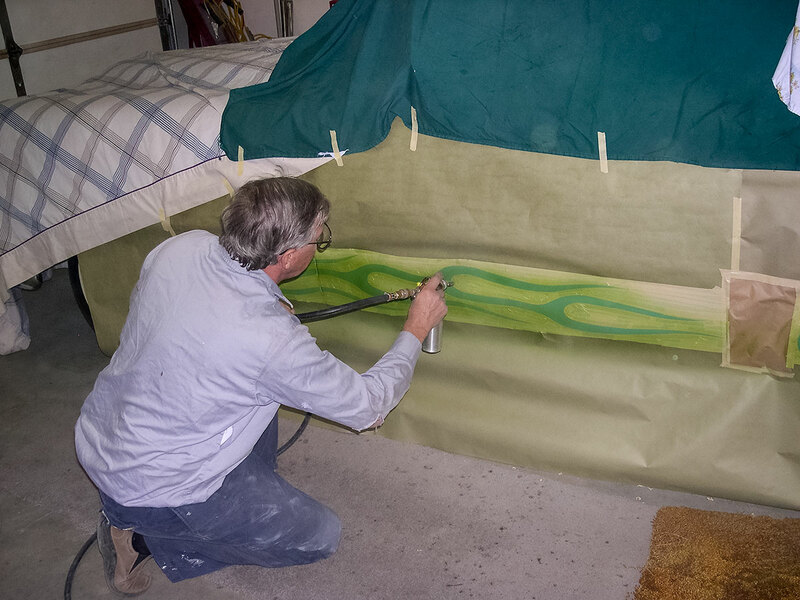 In a nod to Dan’s ‘no shiny paint,’ Roger suggested colored primer instead. The stock 331” engine and 4-speed Hydramatic trans was pulled and overhauled. While the engine was out, the compartment was cleaned and painted body color. The seats were removed and sent to Ed Banes Upholstery in Lakewood, ColoRODo. White and turquoise rolls and pleats were done. Ed did the carpet, door panels, and headliner too. 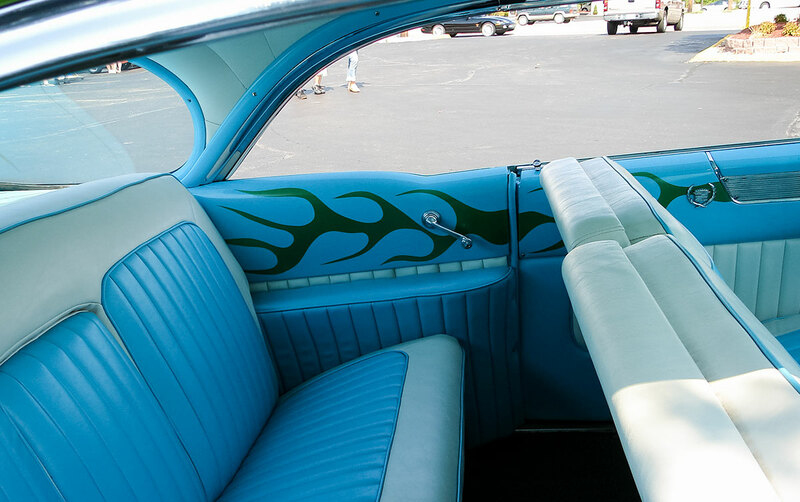 While the interior was out, the dash and moldings were painted ’56 Packard Turquoise and flames added. Around back, the rear bumper exhaust outlets were rusted thru so a pair of front bumper Dagmars were removed from a wrecked ’54 in the junk yard and used on the rear. 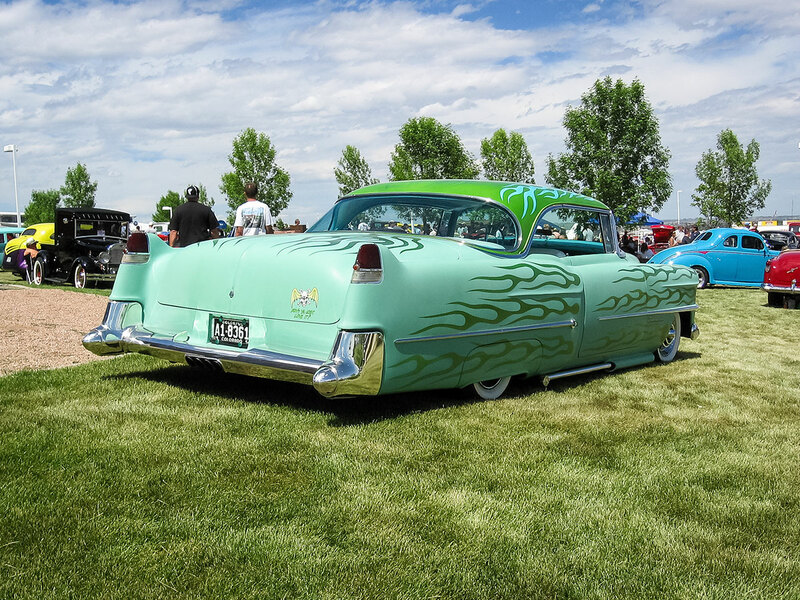 With a spanking new interior, the ‘rat rod’ image was beginning to fade and the primer looked a bit plain, so the top was scuffed and Cadillac LimeFire Mist was sprayed. The turquoise color was picked up from the interior and flames were sprayed in the same color on the roof. 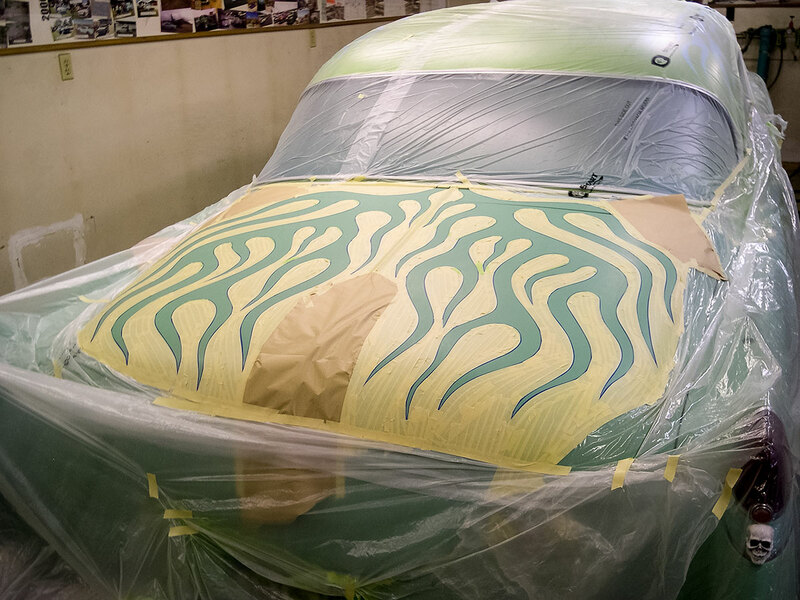 With flames on the roof, the body needed that colored primer. 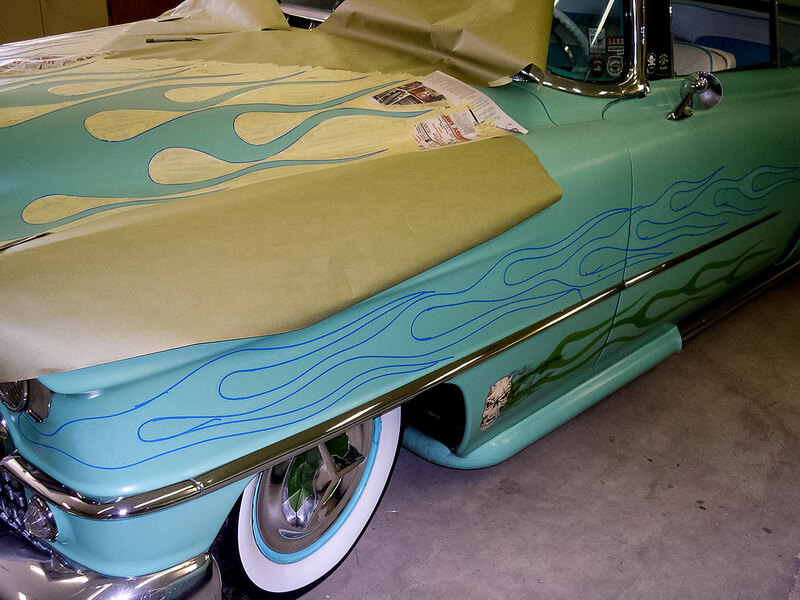 Turquoise primer was purchased and sprayed, the tape came out and flames were added all over the car in the same Cadillac Firemist color. To put the car in the correct era, Diamondback wide whitewalls were added and Sombrero hubcaps fitted. Dan enjoys driving the car cross country and reports nearly 21 miles per gallon @ 70 mph out of the old 331.” It’s a Deluxe Rat Rod now and a great highway car. Cruel tricks can be turned around…Dan enjoys all the looks his Cadillac gets now. 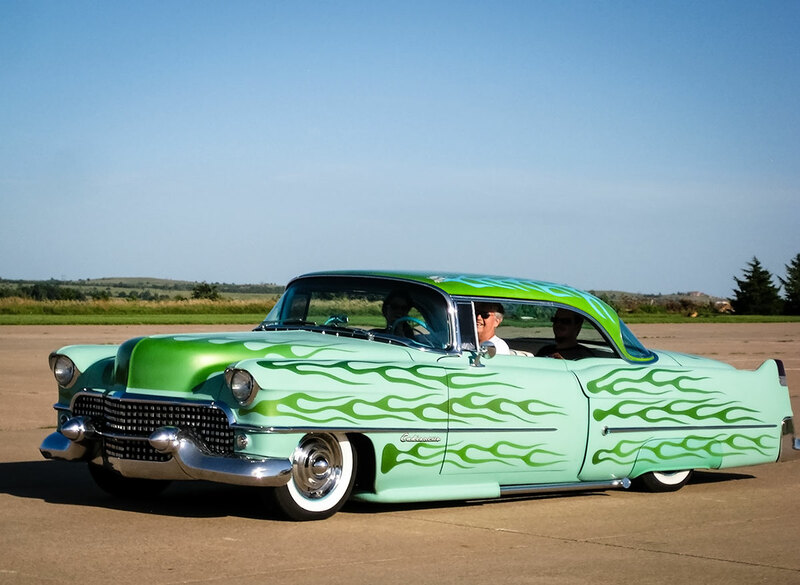 Great to see Dan’s Caddy getting the attention it deserves. I agree and it is such an awesome car. Thanks for the feedback and be sure to check us out on Facebook for more updates. Why Would The CEO Of Honda Not Own A Car?